Local Constituency MSP is supporting Transition Linlithgow’s Last Straw Campaign as part of their Plastic Free Linlithgow Project aiming to reduce plastic around the town. 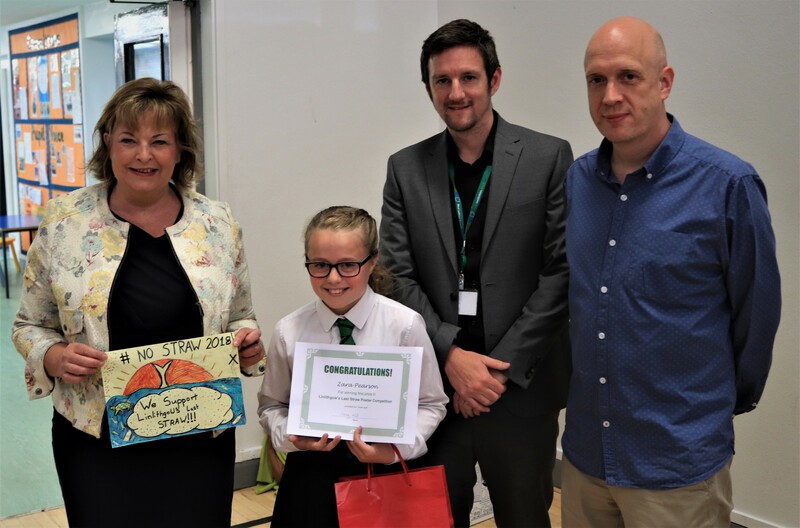 The local schools took part in creating campaign posters to remove plastic straws from within Linlithgow and Fiona Hyslop was the judge who chose the winning poster from a tremendous entry of 300 posters from pupils in the town. The winning poster was designed by P6 pupil, Zara Pearson from Springfield Primary and her poster will be publicised across the business premises in Linlithgow who helped support the campaign in order to promote the eradication of plastic straws from the town. Zara also won tickets for her family to attend Party at the Palace this year as a prize, generously supplied by John Richardson of Party at the Palace. The third place and three highly commended entrants were all at Springfield Primary School. Second place went to Emily Paton from Linlithgow Primary School. “I am very pleased and proud at the keenness of Linlithgow’s young pupils to want to help drum up support to reduce the need for plastic straws and tackle plastic pollution in their town. There were some very talented and creative posters – particularly at Springfield Primary School – and I was delighted to meet Zara to congratulate her for designing the winning poster. “Scotland is the first country in the UK introducing a deposit return scheme for plastic bottles and last week the Rural Affairs Secretary Roseanna Cunningham announced a new Action on Plastic Zero Waste Towns Initiative allowing communities to bid for a share of up to £500,000 to reduce single-use plastics. The Scottish Government is looking at options to reduce single-use plastic items like straws. It follows its decision last year to implement a deposit return scheme for plastic bottles to encourage their recycling.